For the past seven years, photographer and artist Lena Herzog has followed the evolution of a new kinetic species. Intricate as insects but with bursts of equine energy, the “Strandbeests,” or “beach creatures,” are the creation of Dutch artist Theo Jansen, a new life-form that moves, and even survives, on its own. This tribute showcases Jansen’s imaginative vision, a mesmerizing encounter with whole new ideas of existence. For the past seven years, photographer and artist Lena Herzog has followed the evolution of a new kinetic species. Intricate as insects but with bursts of equine energy, the “Strandbeests” or “beach creatures,” are the creation of Dutch artist Theo Jansen, who has been working for nearly two decades to develop a new life-form that moves, and even survives, on its own. 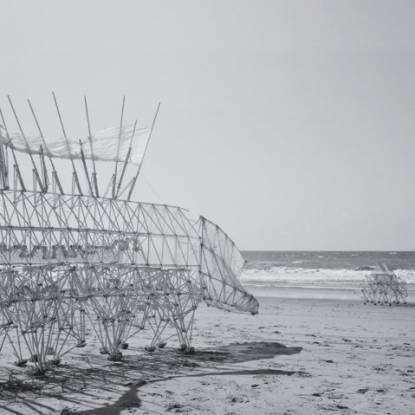 Set to roam the beaches of Holland, the Strandbeests pick up the wind in their gossamer wings and spring, as if by metamorphosis, into action. As if it were blood, not the breeze, running through their delicate forms, they quiver, cavort, and trot against the sun and sea, pausing to change direction if they sense loose sand or water that might destabilize their movement. Coinciding with a traveling exhibition, Herzog’s photographic tribute captures Jansen’s menagerie in a meditative black and white, showcasing Jansen’s imaginative vision, as well as the compelling intersection of animate and inanimate in his creatures. The result is a work of art in its own right and a mesmerizing encounter not only with a very surrealist brand of marvelous, but also with whole new ideas of existence.